Soft cover, A4 in size; 128 pages; colour. Impressive level of research; engaging layout; varied selection of period black and white photographs; competent colour profiles of all production batches. A very comprehensive study on this oft forgotten aircraft. The many changes are well described and the accompanying illustrations and artwork are enligtning. It’s an excellent “one stop shop” for the modeller and enthusiast alike. 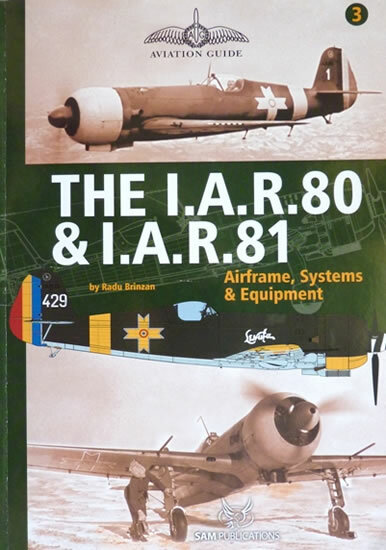 The third volume in SAM Publication’s series of Aviation Guides covers the I.A.R.80 and I.A.R.81. It tells the story of Romania’s only “home designed” fighter to see action in World War II. Its participation in this conflict saw it pitted against many of the major combatants including the Russian VVS and the USAF. Service was with the Aeronautica Regal? Rom?n?, its sole representative. Of the 450 I.A.R.80/81 aircraft built, more than 50% fell victim to either combat or accidental damage. There were successes however and in 3 years of service, the pilots received over 500 confirmed aerial victories in the type. Yet despite these figures, little was published on the aircraft and it remained in obscurity for a long time. Radu Brinzan has used the culmination of twenty years of research to compile a book that was originally intended to be in the “walk around” style. The lack of preserved airframes meant that a compromise had to be made by using technical manuals and their accompanying parts lists for the close-up details. This works very well and the results speak for themselves. The A4 sized publication contains 128 pages between the soft card covers. Various changes were made to the aircraft during the production run and the chapters are divided to reflect this. The text clearly explains the modifications made, and each section has a set of scale plans attached to graphically portray these alterations. The scale drawings do not end here. Further use helps to explain other aspects of the aircraft’s systems and equipment. These include the internal structure, engine configuration, electrical and weapons installation, and much more. Separate chapters are devoted to describing these areas in more detail. 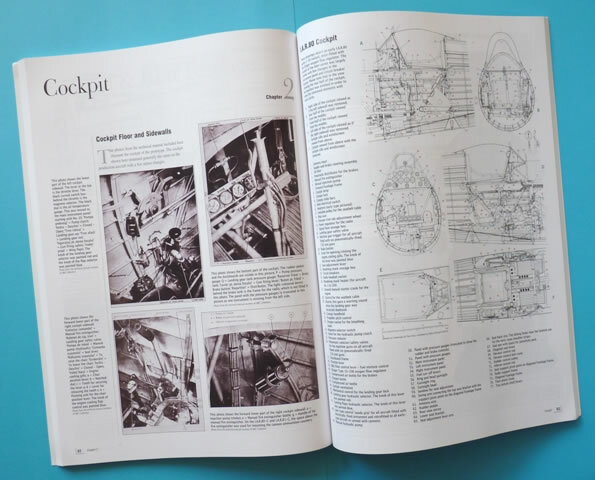 Colour profiles are also a major part of the book and nearly 60 aircraft are presented. Subjects from all production batches are represented and each is competently illustrated. 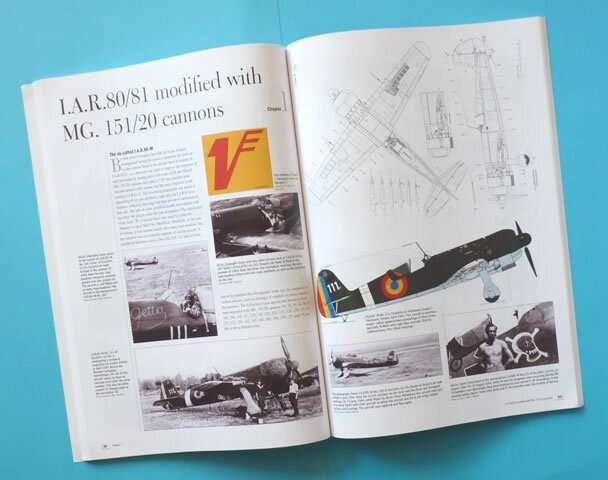 A camouflage and markings section rounds out the publication which includes the all important stenciling that is often forgotten in other publications. The author’s love for this aircraft is clearly evident in the work presented here. He has built upon Dan Antoniu’s research (which was published in 2000 along with co-author George Cico?) and added to it with data of his own. The drawings are a product of 9 months work and are based on original documents, photographs, and the landmark work of Dan Iloiu. There’s a wealth of information for the “rivet counters”. In fact 7,315 rivets were used as of 1941…according to the price list of the time! So if you have a passion for the I.A.R.80/81, then this is an indispensable guide to one of the “forgotten” aircraft of WWII. Thanks to SAM Publications for this review sample.